Planning a trip to Quito? Here’s what you need to know about Quito Ecuador weather – including rainfall, average temperatures (monthly / annual), rainy days, humidity and daylight hours. When you get off the plane in Quito – you might feel the hot equatorial sun, the cool night air or maybe an Andean rainstorm The weather in Quito changes dramatically and sometimes very quickly. This is largely due to it’s altitude. See more below. Questions about weather in Ecuador are super common. 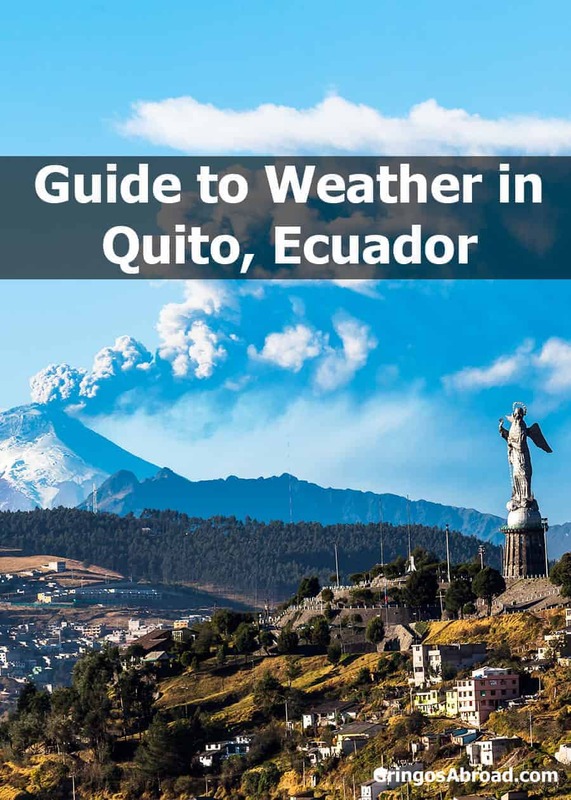 As you plan your trip (or relocation) to Ecuador, it’s pretty important to know what to expect in regards to rainfall and average temperatures. It will affect what you bring and even what you can do. To help answer those questions, we researched the monthly/annual averages for Quito: highs, lows and precipitation. Charts are divided by imperial and metric measurements. I’ve also included rainfall, average temperatures (monthly / annual), days with rain, humidity and daylight hours. Quito is located at 9,350 feet (2,850 meters) above sea level. This high altitude, combined with the mountains around the city can result in thunderstorms that appear (seemingly) out of thin air. Read more about Quito’s location on the equator. Data based on an assortment of charts from across the web. Learn more about Quito with these 17 facts. More reading: Buyers Guide to the Best Sun Protection Hats – specifically for travelers to Ecuador. What do we learn from the charts? It can be a little confusing to sort out the specifics. Here are a few tips for visiting Quito. Best time of the year to visit Quito: To avoid the rain in Quito, you might consider visiting during the months of June through September. When is the rainy season in Quito? It can rain lot during October through May in Quito – and the most during March and April. Temperatures don’t vary much through the year. What does change is the rain – and the resulting humidity levels. Because of it’s location on the equator, Quito has a consistent 12.5 hours of daylight all year long. Quito is home to one of two international airports in Ecuador. Many travelers to the Galapagos and the Amazon first arrive in Quito. Don’t forget to check which Ecuador holiday overlaps with your travel plans. Some of the larger holidays can fill up hotels, flights and tourist attractions. When are you planning on visiting Quito? What part of the city will you be visiting? Have a tip to share? Join us in the comments! Any advice on phones for a week in Quito? Only really want to be able to use Uber, and make/receive emergency calls (elderly parents, etc). We are American, have Verizon, pretty new phones that I don’t want stolen. I keep reading conflicting advice on taxis vs Uber. Lived in Panama when child, and visited several times in last years, speak Spanish. If taxis better option, then don’t care about being able to use phone when away from wifi. Thank you! Am visiting Simon Bolivar and meeting Spanish teacher of last 5 years. Hi Bryan, we just got back from Ecuador, we stayed in Quito, North area close to Cumbaya, and went to Mitad del Mundo, teleferico and La Ronda. Of course, we went to our Christian cong. Meeting, enjoyed informal service!. Then we traveled to Alausi, beautiful weather, and the people, were able to visit a quichua group up in the mountains, none of us know a word in quichua, but we loved It!! Could someone please recommend a safe, clean, reasonable B&B in Quito, close to the bus station? I just need to stay one night, until I can catch the bus to Cotacachi the next day. Additionally, I need a recommendation for a safe, clean reasonable B&B in Cotacachi for a week.